KCA performed the PD&E Study on the feasibility of widening or replacing a 1,266-foot-long structure in southern St. Petersburg; and provided final plans. 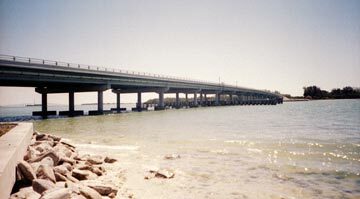 The Bunces Pass Bridge provides the only access to Fort DeSoto State Park and various replacement and rehabilitation alternatives were evaluated to upgrade the bridge width to accommodate two traffic lanes in each direction with shoulders and fishing sidewalks. Hydraulic studies were performed on the tidally influenced inlet to determine high water elevations and probable scour depths. An 18 span, 1,464-foot-long bridge was designed to replace the existing structure. Approximately 2,000 feet of roadway and drainage improvements were also designed to transition the alignment to the new bridge that is parallel and adjacent to the existing bridge. KCA was also responsible for permitting the project through Federal and State agencies.